An ancient disease releases during an excavation of the mysterious Hall of Records located beneath the Sphinx. The archaeologists involved, including Kade, Alyssa’s father, are left fighting for their lives and it is up to Alyssa herself to find the cure. During her search, aided by an Oxford student Paul, she stumbles upon an ancient artefact, which may just be the key to everything. With ruthless adversaries set on getting their hands on the artefact, Alyssa doesn’t have much time to unravel deep secrets hidden within it and unveil the link between a mythical civilisation and the birth of Egyptian mythology. Heir of Ra is a very unique and action-packed novel. Although it is not the genre/topic I usually read, I thoroughly enjoyed it. Both Alyssa and Paul are very likeable characters, there is just the right amount of sass and edge to Alyssa that complements well with the sweet-natured Paul. I was surprised how quickly I read through it. The story was filled with continuous adventures and the suspense was real. The history and mythology in Heir of Ra reminded me somewhat of Dan Brown’s books. M. Sasinowski did a really good job on intriguing the reader and the imaginative way in which he faded the line between reality and fiction was noteworthy. The way the story progressed, it had a nice set up for a continuation and I will pick up the sequel as soon as it’s out. I thin Heir of Ra deserves 4 stars, no questions asked. I deducted a star because I think it was a bit rushed. As I said before, I did like Alyssa and Paul, however I felt that the introduction of the secondary characters was too rapid. I take notes while reading, regardless what book it is, simply to help me when writing a review, but with Heir of Ra I actually did end up making up a character list to wrap my head around it. It’s a relatively short book as it is, 265 pages, so I suppose I wish it was longer to set up the story a bit more clearer. For a debut novel, I think it was a success. I see bits and pieces that the author can improve upon but nothing that can’t be easily fixed. 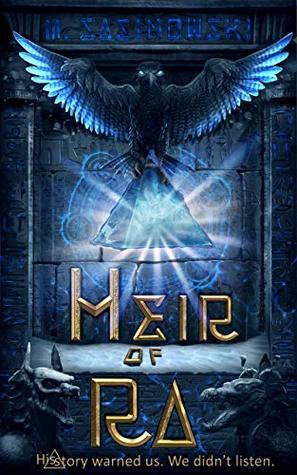 It was a pleasure to read and review Heir of Ra and I hope you enjoyed this post as well! Until next time, Dream On, Dreamer!